When talking about best keyboards from Yamaha The Piano which strikes my mind at first is the P 85 Digital Keyboard (Because it was one of the first few keyboards I tested my hands on). Although the piano is pretty outdated (Launched In 2007) but still it is selling like a hot cake all around the world. 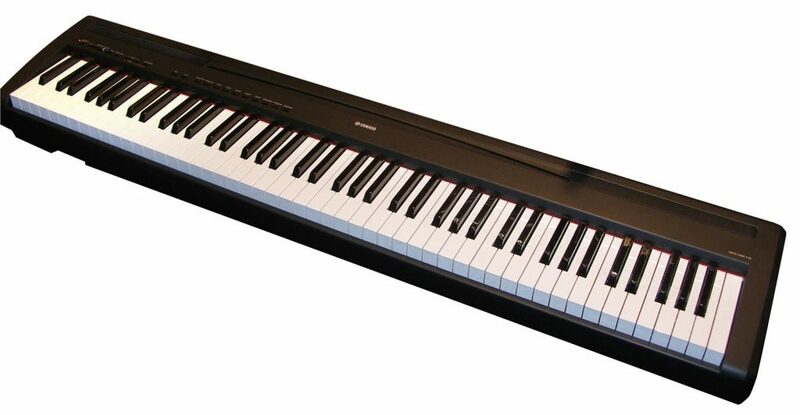 If you are interested in latest Yamaha Series keyboards then check our Yamaha Keyboard Category. So let’s check why Yamaha P85 has made a place in heart of many pianist. The sound of P85 is simply awesome, the grand piano tone in P85 is exactly resembles the sound of acoustic grand pianos. It also has a different tone of another grand pianos too. P-85 comes with lots of inbuilt sounds like a couple of electric pianos, church organs , strings, harpsichord and vibraphone. Yamaha P85 also allows you to layer 2 sounds so you can hear them both at once. Example If you want two tone one of grand piano and other string than all you have to do is touch the button of the two sound and its done. It can’t get more simple than this. Yamaha P 85 comes loaded with few demo songs. These allows you to either listen those songs on your own or practice them if required. It also has built-in metronome to help with your timekeeping while you’re practicing the piano. There is also a one track recorder which comes very useful when working on a song. You can record it and listen back later to search for points you need to work on. To record you just need to touch the record button to activate it and touch again to stop it. You can listen back to your recording when the red light stop flashing. For practicing without disturbing your family members Yamaha P 85 offers a headphone jack on the front face of the keyboard. Practicing in headphone is a great way to dive into the sounds and listen even to the minor details which is not possible to hear on the built-in speakers. Yamaha P 85 also has two ports in the back for connecting your MIDI device (MIDI is a technology that allows you to transfer data between the piano and a computer). MIDI comes useful when if you are interested in using music lesson software, notation or recording software. If you are going to purchase Yamaha P 85 than I would suggest you to opt for the bundle. Because budles comes with music rack, power supply, owner manual and plastic foot switch which will function as a sustain pedal. In short I can say that Yamaha P85 is good piano but it is outdated (2007). Due to this it lacks lot of features that latest digital pianos comes with. But it is still noteworthy if you are on tight budget. It is not available on lots of sites but you can still found it on used piano sites or local shop or on ebay, the second hand piano will definitely cost upto 70% less than the original price of Yamaha P85. So that’s all for today. Hope our article has helped you in making a better decision.